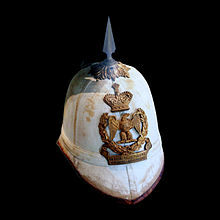 The pith helmet, an icon o colonialism in tropical launds. This ane wis uised during the Seicont French Colonial Empire. Colonialism is the establishment o a colony in ane territory bi a poleetical pouer frae anither territory, an the subsequent maintenance, expansion, an exploitation o that colony. The term is an aa uised tae descrive a set o unequal relationships atween the colonial pouer an the colony an eften atween the colonists an the indigenous fowks. This page wis last eeditit on 25 Mairch 2017, at 00:53.